Louisiana Gov. 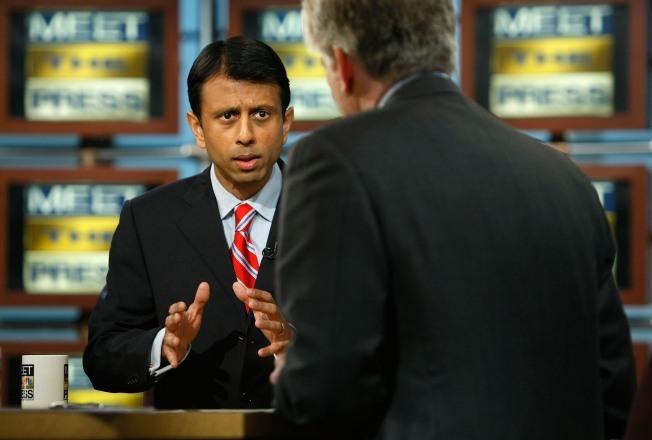 Bobby Jindal (L) shares his plans -- or non-plans --for the federal stimulus money. As he delivers his first major address to the nation tonight, President Obama still operates under a great reservoir of good will from Americans . Even despite the partisan divide produced by the stimulus package, Obama gets about nearly two-thirds support from the public. As the GOP attempts to carve through this basic reality, it might behoove Republicans to admit how their actions have helped contribute to the growing public willingness to let government try to spend its way out of the current problem. Their critique on spending is falling on deaf ears for a very good reason: They were for it before they were against it. Everybody loves to take credit for bipartisanship when it comes to smart decisions and successful outcomes. But, like defeat, foolish bipartisan choices and decisions are true orphans. Many Republicans remain vehemently opposed to the spending in the stimulus package. GOP governors like Haley Barbour of Mississippi, Bobby Jindal of Louisiana and Mark Sanford of South Carolina are all talking about rejecting parts of the stimulus because it "might" lead to taxes down the road (though there is doubt whether governors can pick and choose from financial packages they get from the feds). In the narrowest sense, they have a point: They're right not to accept a financial gimmick that might undercut the dramatic progress welfare reform has produced. However, the argument that the GOP is concerned that accepting spending now may cause tax increases in the future rings a little hollow. Gov. Jindal, during his one term in Congress, voted for continued spending on wars in Iraq and Afghanistan -- which was fine (putting aside reasons for supporting those two wars). What wasn't good -- and something for which Republicans never held President Bush accountable in the years they had the majority -- was not including spending for the wars in the annual budget. Sticking war spending in "supplemental" budgets ends up doing two things: 1) It masks the size of annual deficits; 2) it creates yet another "emergency" atmosphere where it's impossible to have honest debate. The administration just gets to name a figure -- and Congress has to approve it "for the troops." It was a dishonest, though effective short-term strategy -- thus explaining Obama's adoption of a similar approach for the stimulus package. (To his credit, the budget Obama introduced this week includes spending for both Iraq and Afghanistan) . But, it's a bit, uh, rich for Republicans now to equate more spending with future tax hikes. After a Republican president and (predominantly) GOP Congressdoubled the national debt in eight years, did they really think the country would escape paying off that debt without tax hikes eventually? And now, given how suspicious the public is now of the business community, it's no surprise that the party most associated with the private sector is taking a beating after betraying its own principles in that area.